AMERICAN JUDAICA. GEORGE WASHINGTON. Book. 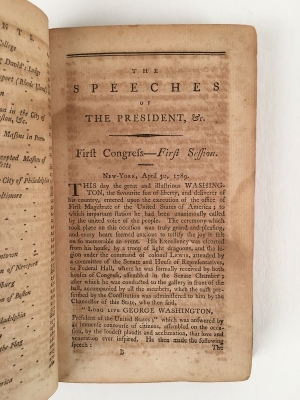 A Collection of the Speeches of the President of the United States to Both Houses of Congress, At the Opening of Every Session, with Their Answers. 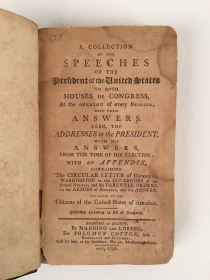 Also, the Addresses to the President, with His Answers, From the Time of His Election: With An Appendix, Containing the Circular Letter of General Washington to the Governors of the Several States, and His Farewell Orders, to the Armies of America, and the Answer, FIRST EDITION. Boston: Manning and Loring, 1796. 8vo., 4¼ x 7 in. 282 pp. Foxed. Contemporary blind-tooled calf, scuffed, rebacked. During the struggle for the passage of the Maryland Jew Bill (to eliminate Jewish disabilities in the state) at the beginning of the nineteenth century, one supporter, Col. William G. D. Worthington, delivered an address before the State Legislature and read the entire correspondence between the Jews of Newport and Washington. The letters continued to be cited by Jews and their advocates throughout the nineteenth and early twentieth centuries to demonstrate that the founding father had fully sanctioned their inclusion into the American nation. 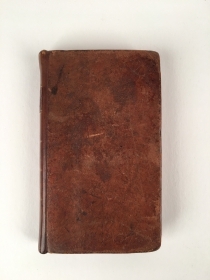 This volume also includes eleven other addresses from religious denominations, ranging from Catholics and Lutherans to Methodists and Quakers, to George Washington expressing their congratulations to and appreciation of him, together with his responses to them. 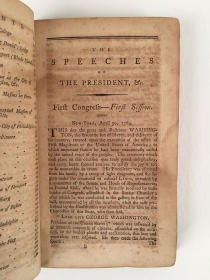 In addition, addressed from more than fifty other groups of citizens and Washington’s response to them appear in the volume. Groups range from state governors and legislators to mayors and town councils, from college faculties to the inhabitants of individual towns, from groups of Masons to groups of tradesmen. Together, these addresses provide a remarkable view of the relationship of many groups of Americans to their first president. 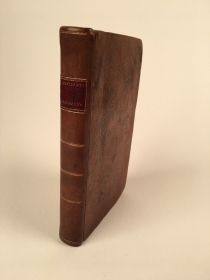 This collection includes thirteen of Washington’s important letters to religious congregations. 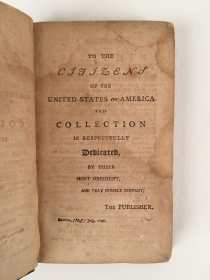 The Washington letters to religious congregations not included are to: the United Baptist Churches in Virginia (August 8, 1789); Moravian Society for Propagating the Gospel (c. August 15, 1789); the Society of the Free Quakers (March 1790); the Hebrew Congregation of Savannah, Georgia (May 1790); the Clergy of Newport, Rhode Island (August 18, 1790); the Congregational Church of Midway, Georgia (May 13, 1791).